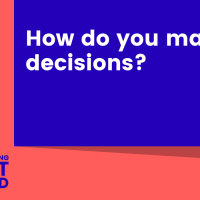 Marketing Out Loud: Episode 166 - How do you make decisions? Without having to lift a finger, you can have qualified leads magically handed to you on a silver platter. All you need to do is show up, have a brief conversation, and collect your check. generation companies would have you believe. Just pay them a hefty monthly retainer, sit back and let them take care of the rest. I’m not saying this can’t work. Outsourcing lead generation is NOT a marketing strategy. By all means, outsource some of your marketing execution, if and when it makes sense. But you CANNOT outsource marketing strategy.